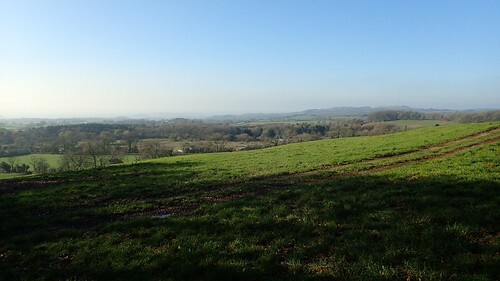 I don’t do too many walks in the eastern half of Somerset. 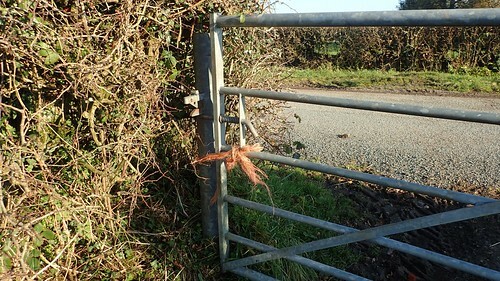 It’s really not that far from home but, each time I do head out that way, I either come home having lost something or find myself frustrated by a flurry of footpath obstructions. 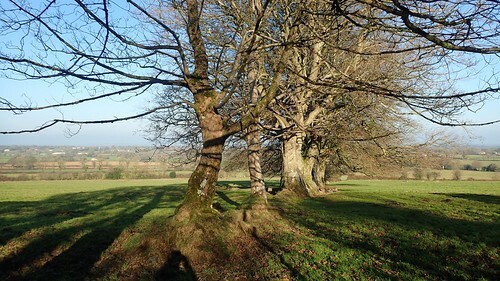 Having just purchased a book at the time, titled Beyond Bristol Walks, I decided to head out and follow one of Robin Tetlow’s routes. 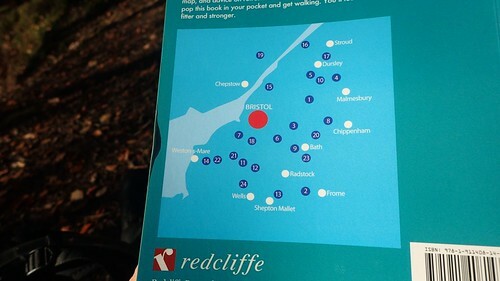 If you live anywhere close to Bristol or are searching for inspiration of walks in the relative area, I would like to strongly recommend this book to you. 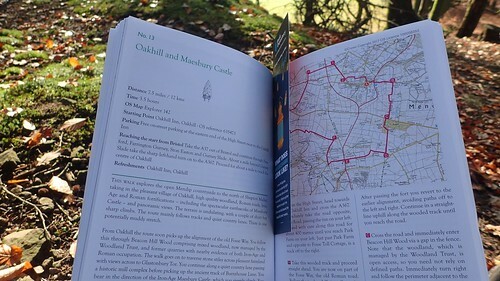 I don’t often use books or online guides for my own routes, simply because I find the enclosed mapping to be inferior. But Robin has acquired the rights to include Ordnance Survey mapping alongside each of his written routes. With all of the included detail, I think this is an excellent touch and should enable anyone heading off-course to find their way back on to it. 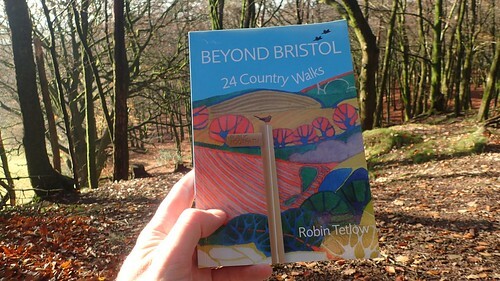 Beyond Bristol Walks on Amazon. 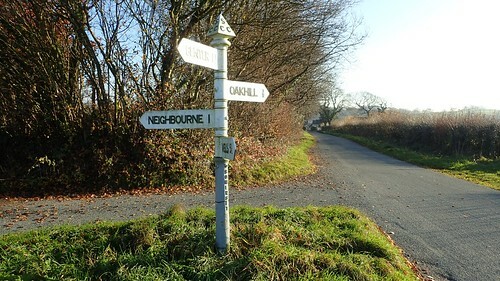 It took me less than one hour to drive east across Somerset and to reach Oakhill. 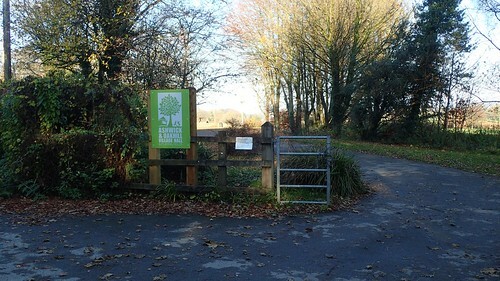 I made one change to the very start of Robin’s route, where I decided to use the village hall car park, as I don’t often like parking at the side of a road when I can avoid it. 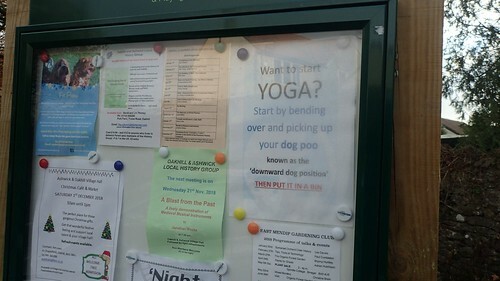 This was on the noticeboard outside. I’d be curious to see how (or if) an offender reacts to such a suggestion. 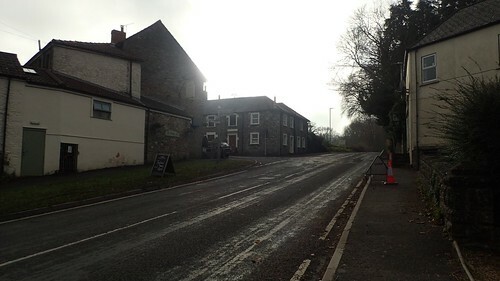 Heading down in to Oakhill and the official start of the walk, I soon crossed the A367 Bath Road beside the local pub. A right-turn awaited, further ahead. 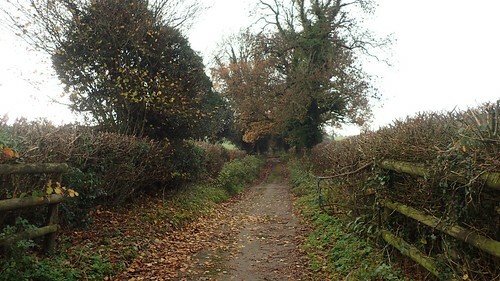 It’s not signed as a right of way or dead-end road… But the public has every right to follow it on foot. This track follows the line of the Fosse Way; an historic Roman Road that was crossed the country between Dorset and Lincolnshire (if my memory’s correct). 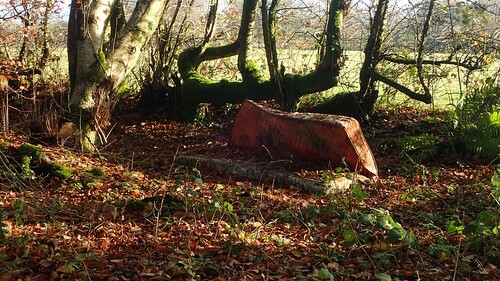 A discarded mattress signified that I was not far from the Old Frome Road. 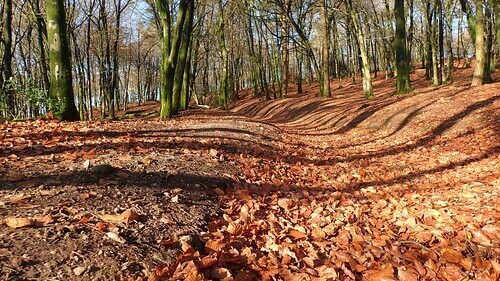 I crossed the true-as-an-arrow Roman Road in to Beacon Hill Woods. 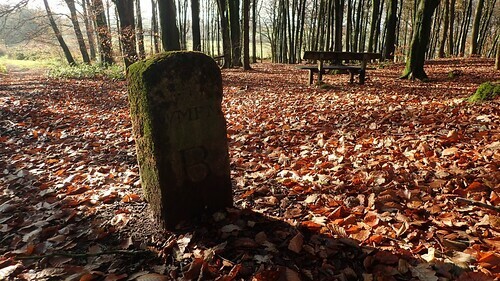 At 295 metres above sea level, it’s one of the local high points and probably would’ve been a good lookout position, hundreds of years ago and before the birth of its now many trees. I hadn’t followed the multi-use bridleway through the woods, but a path that’s permissive for walkers and runners. 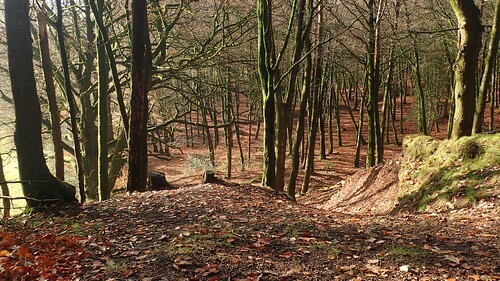 Ahead of a short but sharp descent, I found a quiet place to stop for a morning break. I witnessed only a small number of dog walkers and I can imagine it’s a very popular area for locals. 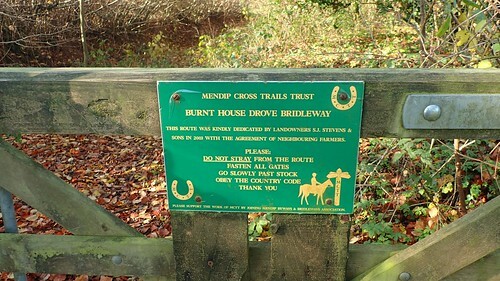 Those who look after the space seem keen to protect it, with signs asking horse riders and cyclists to stick to the designated bridleway (outlined by inscribed standing stones). 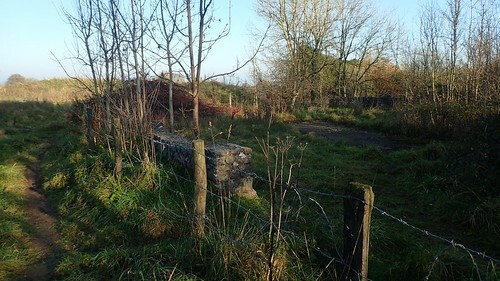 At the end of this next track, I’m barely one mile north of Shepton Mallet. 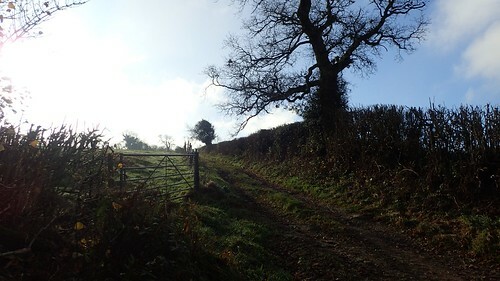 I continued west through Upper Downside; crossing farmland with the occasional double or ladder stile. 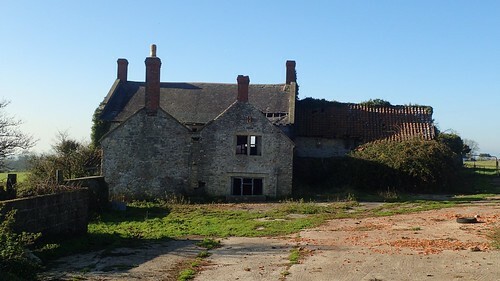 These buildings were derelict and left to ruin. Quite sad, considering its close proximity to a known Somerset town. Were the owners forced out of business by cheap EU imports? 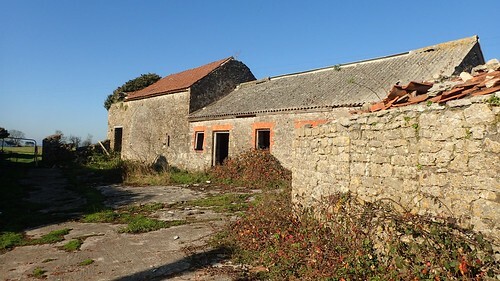 How long before an under-pressure council is concreting over this patch of heritage with dozens of quick-to-build houses? 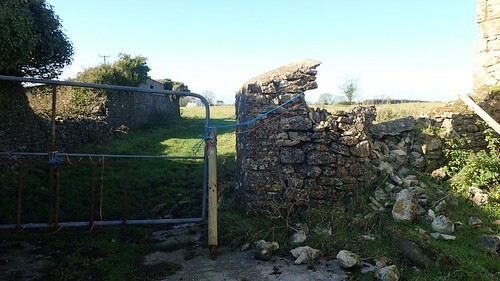 Following the right of way through this boundary, I found it much easier to climb through the gate that to attempt to unravel its means of security. 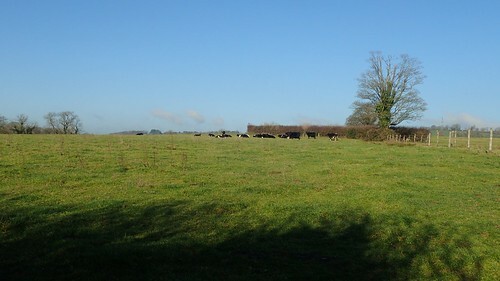 Some of the land, at least, is still be used for grazing. Thankfully, these cattle showed no interest in my presence, as I crossed their territory. 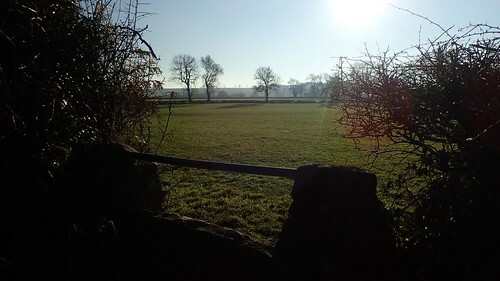 From here, the walk follows the road up past Mill House Farm and then left along Burnthouse Drove. 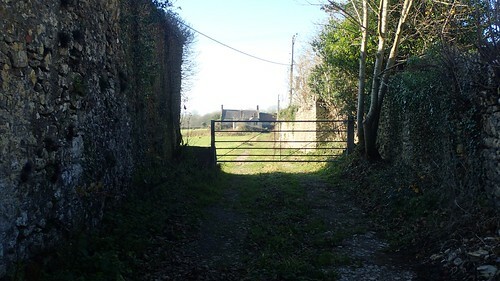 Interestingly, it bypasses a small network crossing land beside Burnt House Farm… I wonder how accessible those footpaths may be? 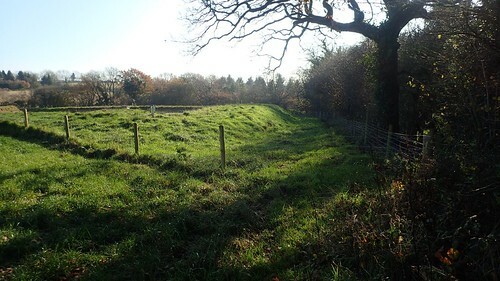 But then, the owners seem keen to allow the public to use this bridleway, which also crosses their land and provides a fairly direct link with Old Frome Road. To me, it looked as though the public right of way continues through the (locked) gate around around the rear of the pond… And the GPS service on my phone was able to confirm this. I decided not to jump the gate but to walk around. A path had been worn in to the grass and, for whatever reason, it seemed evident that someone wanted people to keep out. 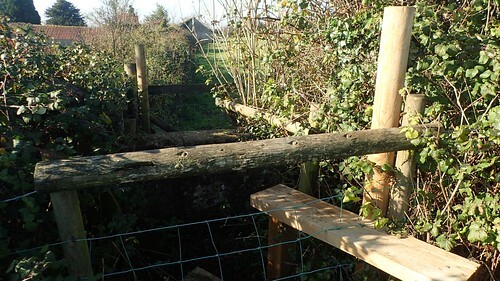 At the other end, there wasn’t even a gate to pass through. According to the GPS signal on my phone, I’d clearly wandered from the legal right of way, in my effort to follow the fence around the pond. Another track would lead me to the next road. 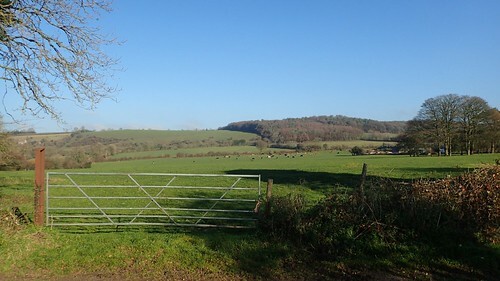 While, to my left, I could now see the man-made bank of earth that would’ve once carried the railway line two and from Shepton Mallet’s iconic (but disused) viaduct. 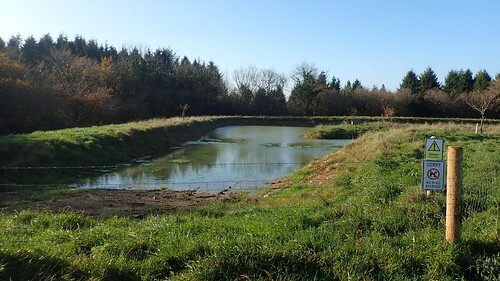 Here’s another view of that bank, now bisected by a road. It’s a shame, I think, that nothing was done to preserve its status or at least transform it in to a cycle path. Our congested roads can only take so much more. 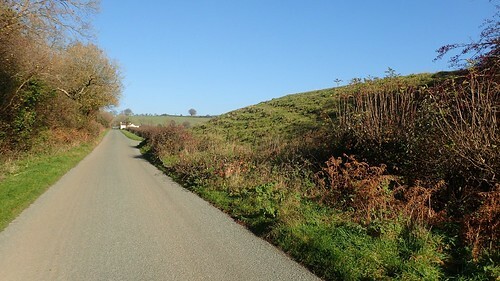 At the end of this road, I’d have to cross Old Frome Road for the final time and began my climb up to Maesbury Castle, an Iron Age hillfort. 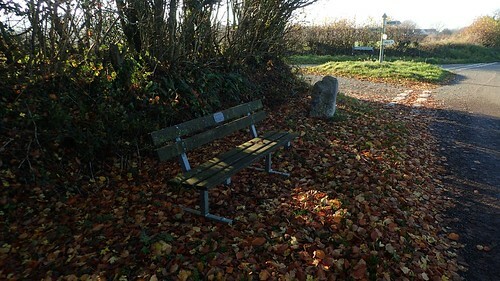 I had thought about taking a detour to reach this point on my completion of the East Mendip Way last year… But that probably would’ve added four-miles to a day’s walking when I was already covering around sixteen miles. 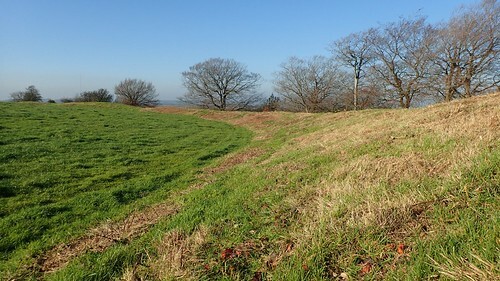 Up and over the ramparts, I crossed the slightly convex plain in the centre of the site. 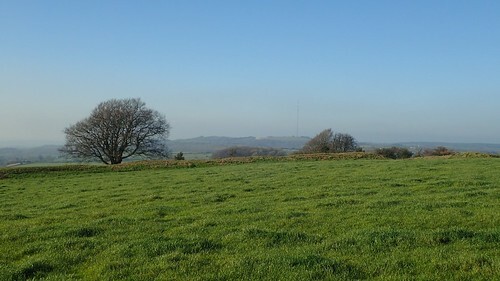 Away to my left, I could see the iconic transmitter standing above the city of Wells. 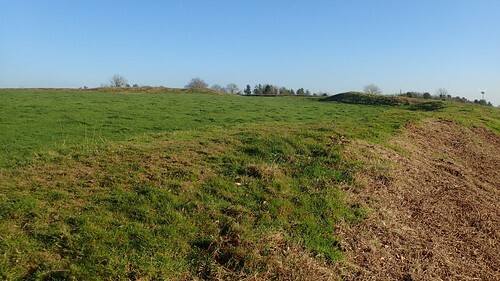 Without venturing any further, I stopped for lunch inside the fort, using the circular bank of earth as a very convenient windbreak. 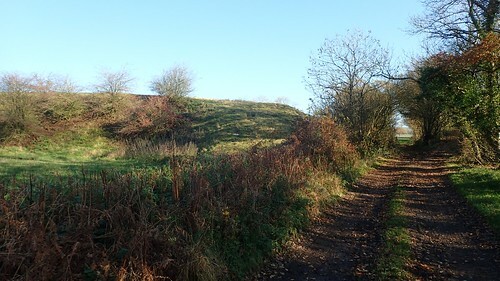 I was grateful to not have to traipse through a nearby golf course after lunch, as my walk continued across fields, the course of another Roman Road and then on to a bridleway named Limekiln Lane. 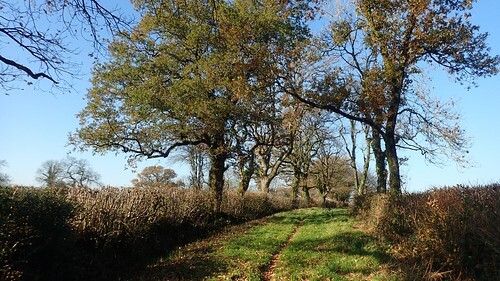 I soon left the lane to head across a field in the direction of the next road. I don’t recall seeing a footpath sign leading to or from this field, although it was certainly along the public right of way. 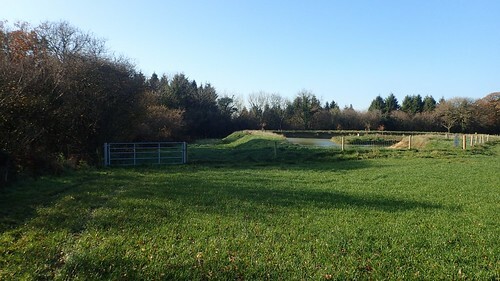 In spite of the fact that’s now beside a road junction and only 500 metres or so from the A37. 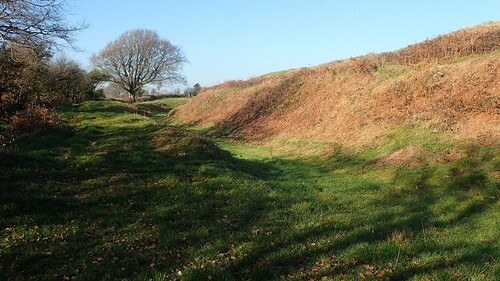 Following field paths from Little London and back to Oakhill, I passed the site of former limekilns. 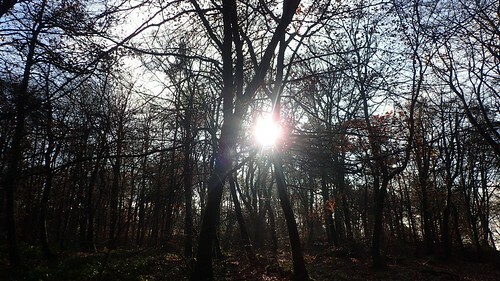 Soon after this, I’d be back at my car and preparing for the drive home after a short but enjoyable walk in an area I hadn’t quite previously explored. 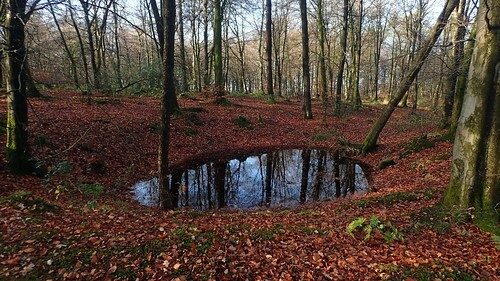 This entry was posted in Walking and tagged Beacon Hill Woods, Beyond Bristol Walks, disused railway, East Somerset, Fosse Way, guide book, hillfort, Iron Age, Maesbury Castle, Oakhill, Robin Tetlow, Roman Road, Somerset, walking route on 29/12/2018 by Olly Parry-Jones.